Home Development iPhone5 launch News Special Offers Special Elite Edition Of iPhone 5 Available for £20,000! Special Elite Edition Of iPhone 5 Available for £20,000! 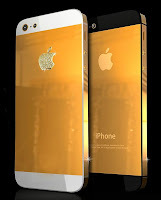 Stuart Hughes – a designer from Liverpool has launched an 18-carat gold editions of the Apple’s latest flagship iPhone 5. The gold-plated version of the world’s most highly demanded smartphone is expected to sell for a massive£21,995 each! According to the designer Stuart Hughes, “this beautiful handset will take weeks of detailed intricate work to re-create the original chassis of the iPhone in solid gold, all of which was started and finished by hand. There will be gold dressing for the rear section with the logo in solid gold with 53 flawless diamonds amounting to 1ct.” The handset is 64 GB one and is available as a limited edition of only 100 items. It’s also been reported that the special iPhone 4S Elite Gold also designed by Hughes has been bought by an Australian businesswoman for a weighty £6 million! To your surprise, the news comes from DigitalSpy - a British network of sites about digital TV, broadcasting and programming with a fair 12 years of year of operation, so there’s no ground for being susceptible about source the credibility.